You can visit Google APIs Explorer - search watch. There are few APIs support push notification now. Not all of them. calendar.settings.watch Calendar API v3 Watch for changes to Settings resources. calendar.acl.watch Calendar API v3 Watch for changes to ACL resources. calendar.calendarList.watch Calendar API v3 Watch for changes to CalendarList resources. calendar.events.watch Calendar API v3 Watch for changes to Events resources. storage.objects.watchAll Cloud Storage API v1beta2 Watch for changes on all objects in a bucket. storage.objects.watchAll Cloud Storage API v1 Watch for changes on all objects in a bucket. youtube.playlistItems.update YouTube Data API v3 Modifies a playlist item. For example, you could update the item’s position in the playlist. drive.changes.watch Drive API v2 Subscribe to changes for a user. 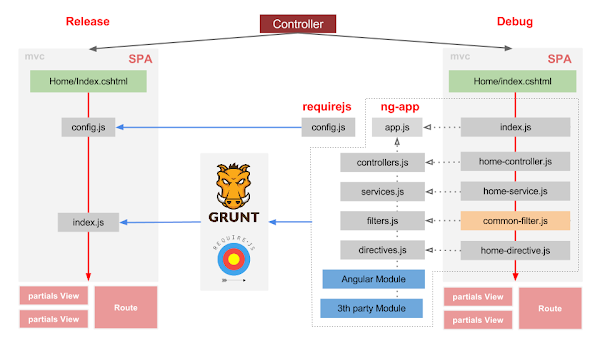 In previou aticles that we talked about how to integrate AngularJs, Requirejs, Grunt and bower with ASP.NET MVC. If you don’t want to create those file structure manual. You can install generator-angular-requirejs-grunt-bower yeoman generator. As basic concept we mentioned that we want to treat ControllerName/actionName as single page application and try to reuse shared code as possible base on this file structure. 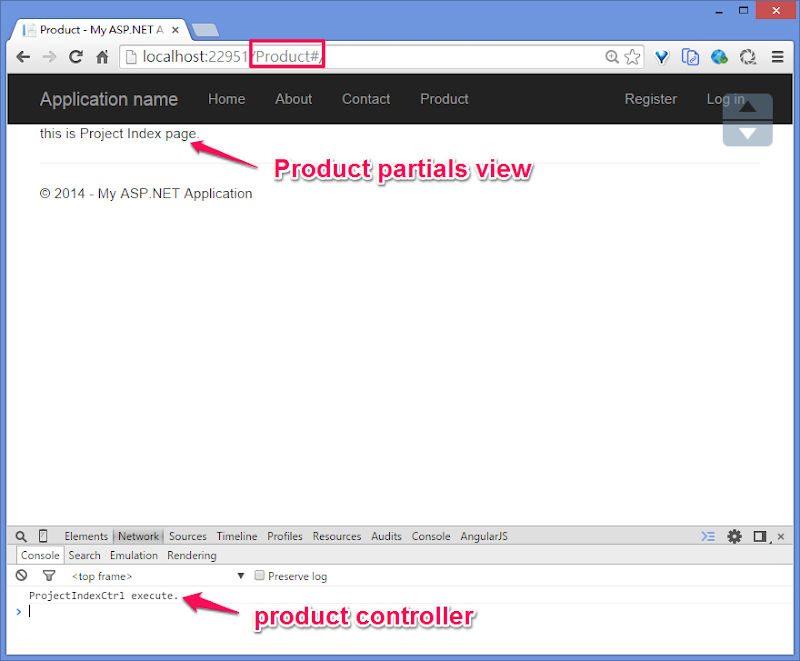 Now, let’s create a new ASP.NET MVC controller and extend new AngularJs application. please create a new controller named ProjectController via Visual studio. modify Views/Project/Index.cshtml. The only thing you need to do is add Angular route directive ng-view. We will handle UI in AngularJs partile view. create file structure as following. Public/js/views/Project/patials/project-index.html, default AngulaJs route view. this is Project Index page. index.js: Product AngularJs single page application entry point. Till now, we have two AngularJs single page application HomeController and ProductController and they don’t include any AngularJs service, directive or filter module. Add a new AngularJs service locate in Public/js/service/book-service.js. If you are familier with AngularJs. There is a resolve function you can call in AngularJs route. We define a BookLoader function that implement with promise pattern. Then, we can inject the result to our controller. Resolve can help us to fetch API before controller called. How can we inject book service to AngularJs application via RequireJs require feature. That’s mean we can inject different feature in other application easily. We have defined BOOK AngularJs service. Different with Product application. We use BOOK service instead of BooKloader promise service. We inject BOOK service in controller directly and bind Book.get() to $scope.books. 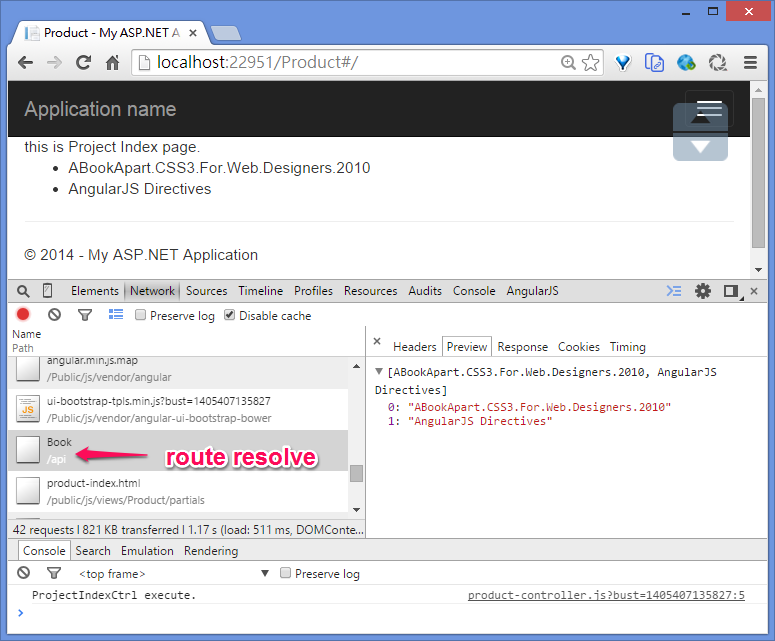 Whatever we use AngularJs route resolve or inject service directly. They points to same service we defined. As we mentioned before. we still can build for every AngularJs we defined. Befere we build our application, we need to modify Gruntfile.js manual. git checkout -f step-1 is status Nuget install Require.js. git checkout -f step-2 is status project Add AngularJs, RequireJs, Grunt and Bower to Public folder. git checkout -f step-3 is status modify _Layout.chtml to render RequireJs. You will see the final result. Please cd to AngularJsRequireJsGruntBower\AngularJsRequireJsGruntBower\Public and execute bower install to restore those library project included. git checkout -f setp-4 is status ready to do grunt tasks. Please cd to AngularJsRequireJsGruntBower\AngularJsRequireJsGruntBower\Public and execute npm install to restore grunt required libraries. execute command grunt to do grunt tasks. We are talking about integrate AngularJs, RequireJs, Grunt and Bower in ASP.NET MVC project in previous part. Above is the font-end file structure we mentioned in previous articles. It’s dozens of files we need to create. So, i put those of work to yeoman generator-angular-requirejs-grunt-bower. The Grunt ecosystem is huge and it’s growing every day. With literally hundreds of plugins to choose from, you can use Grunt to automate just about anything with a minimum of effort. If someone hasn’t already built what you need, authoring and publishing your own Grunt plugin to npm is a breeze. If you are familiar with Grunt. You could feel how powerful it is, how could it reduce your repetitive tasks and make your work more easier. 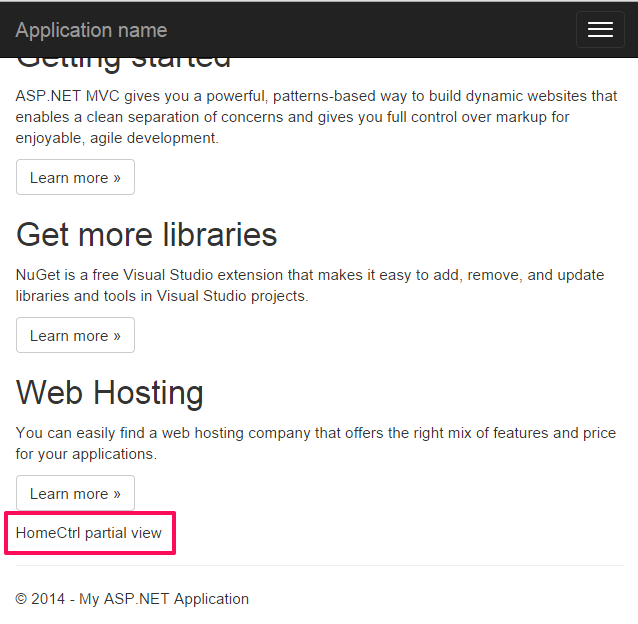 In AngularJs, RequireJs, Grunt and Bower Part1 - Getting Started and concept with ASP.NET MVC ~ 竹部落 post. We talk about how to integrate AngularJs, RequireJs, Grunt and Bower with our ASP.NET MVC project and put all of code in Public/js folder. Browser will load those files one by one by following RequireJs definition and dependencies we define in Public/js/config.js. Be a large AngularJs single page application, you might include a lots of file to the project. For example: in our ASP.NET MVC project. Implement the file structure i mentioned in last post. Browser will load more the 20 file. Web page loading speed will increase if browser load more files. During development, separation of concerns (SoC) will help us to break down the problem to smaller. 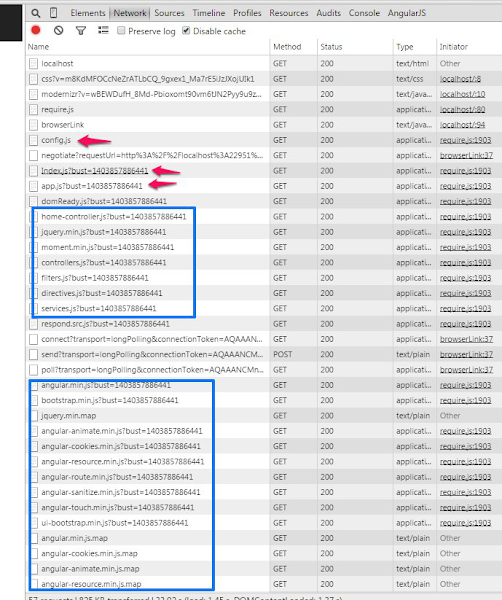 So, we need a solution to help us to combine related file and decrease web page loding speed in release mode. That’s Rquirejs + Grunt. Our gold is improve page loading speed by reduce include file count in our project in final release/product. RequireJs has an optimization tool can help us to combine related file and minifies them and grunt-contrib-requirejs and put RequireJs work with Grunt well. Combines related scripts together into build layers and minifies them via UglifyJS (the default) or Closure Compiler (an option when using Java). Optimizes CSS by inlining CSS files referenced by @import and removing comments. We can define multiple grunt tasks in Gruntfile.js. All you need to do is executing command grunt. Grunt will execute all of tasks one by one. How, let we check before doing the grunt task. using bower package manager to handle what library we include and put all libraries in vendor. Ex: AngularJs, jQuery , moment ects. config.js define the library dependencies and library path. implement file structure as we mentioned before. Our Grunt scenario is copy required file from public/js/... to public/tmp/... folder. Grunt task requirejs:complie will combine scripts together and put it in public/release folder. grunt-contrib-requirejs optimize RequireJS projects using r.js. Most of needed configuration is same as RequireJs required but file path. We need to modify file path to our temporary folder tmp. One more thing. We need to replace file path in our release RequireJs config.js from js to release. It will make sure relese RequireJs config.js is reference to current source folder. Visit to Github to check whole Gruntfile.js file. After you execute command grunt. build.txt will be created automatically. It is a requirejs:complie log file and show you a list what libraries and user define scripts are combined together base on Gruntfile.js requirejs complie module setting. 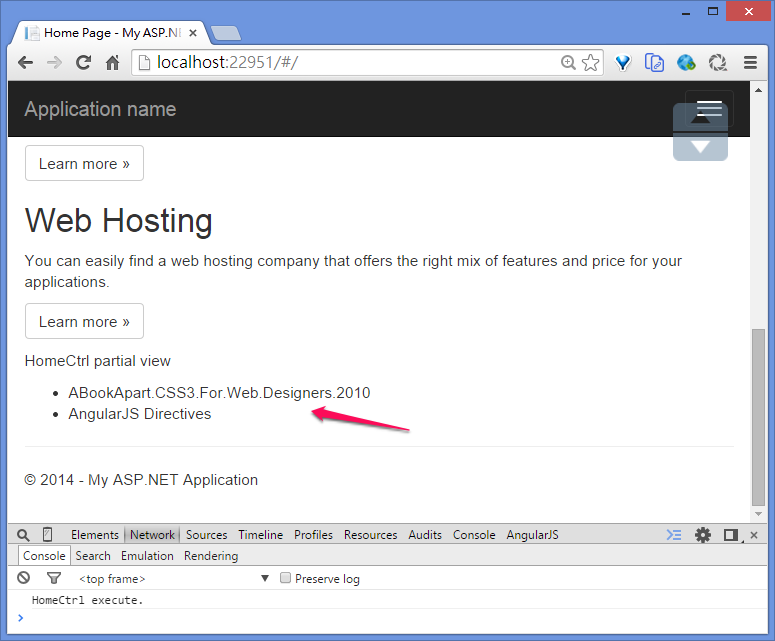 AngularJs, RequireJs, Grunt and Bower Part1 - Getting Started and concept with ASP.NET MVC. It’s very easy to use AngularJs in your web application page. MVVM concept and powerful two-way databinding can help you solve the problem you might working hard with jQuery. But for the large web application. Is a better way to integrate AngularJs in your project? YES, you can re-factor your code to module and include it to project. 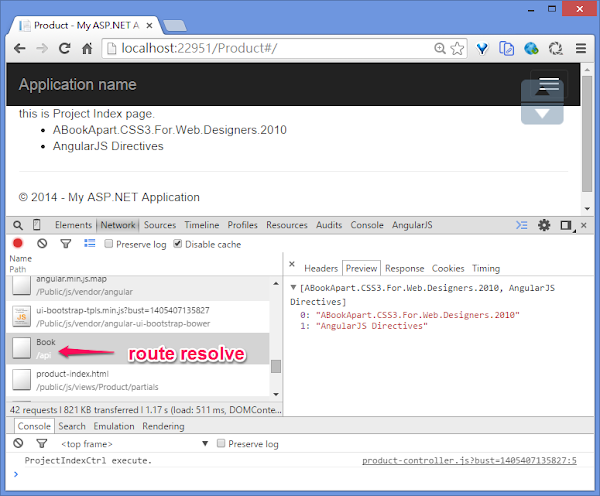 For Above route URL, we can get different ASP.NET MVC view page. But, i want to treat each of them as individual SPA (single page appliation) and share the same code (AngluarJs server or AngularJs filter modules etc.) for different SPA. My solution is base on Yngve Bakken Nilsen article (RequierJs with ASP.NET MVC) but integrate with AngularJs, Grunt and Bower. Above is ASP.NET MVC normal file structure. You can add NameController and assign view template views/ControllerName/ActionName to render view page. As i menetioned before, i’ll like to treat Views/Controler as SPA. so, i rearrange the basic file strcutre and put all of Javscript file in Public folder. for the controller has more than one action view page. I move those page to front-end AngularJs framework. 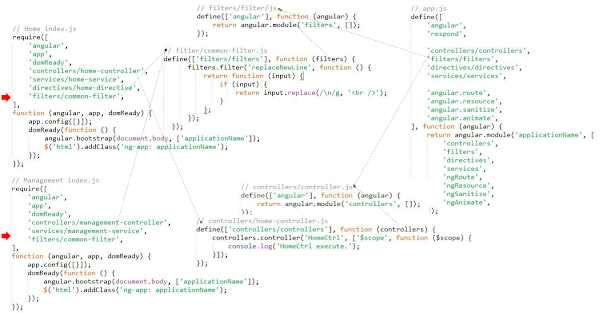 AngularJs route will handle this part. As you can see the modified file structure. 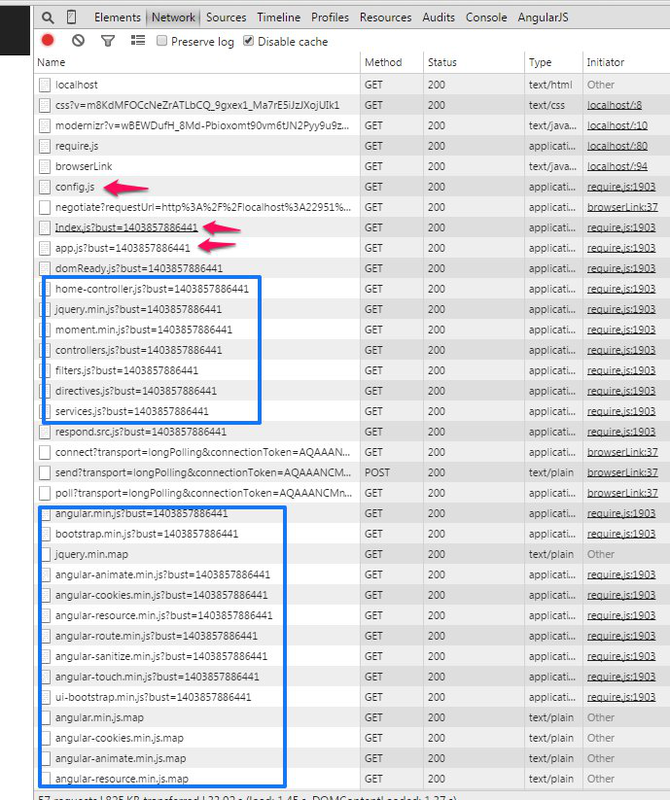 Public/js/views file structure like ASP.NET MVC Views. 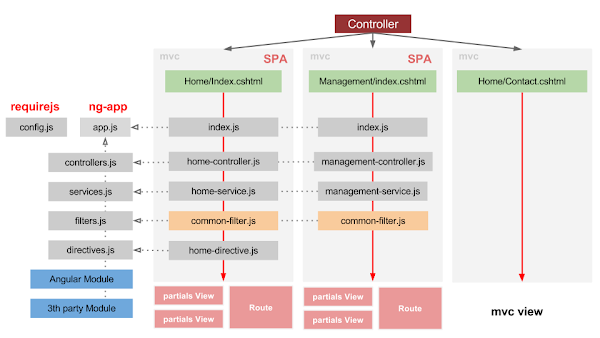 So, we could dynamic to load SPA by RequireJs if we have defined it in Public/js/views/mapping to ASP.NET MVC controller. // no any AngularJs application will be loaded. 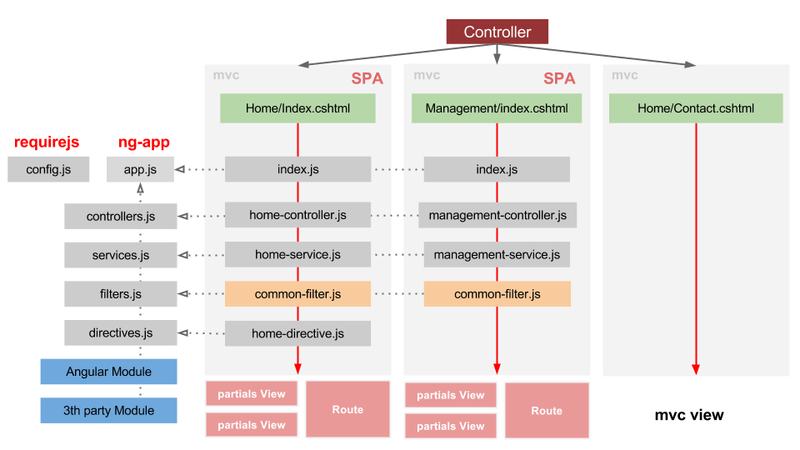 The basic concept is that i want to treat ASP.NET MVC route Views/ControllerName as a individual AngularJs SPA and Dynamic be loaded if i have defined it. Define AngularJs module using RequireJs define. Include needed module with RequireJs require. 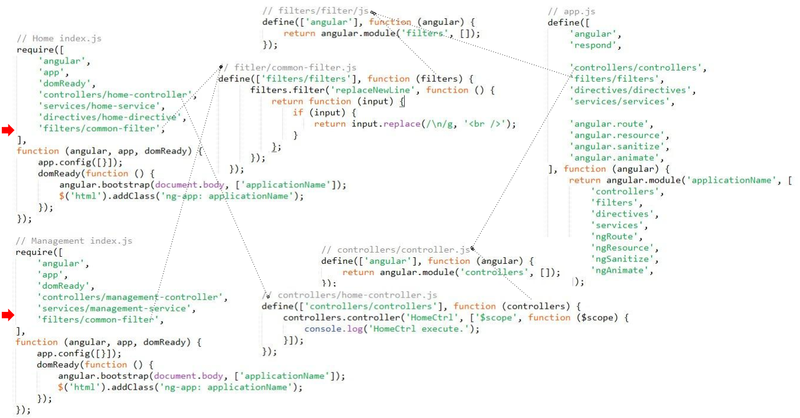 I can define task orientation AngularJs module as you can see in above diagram. It’s easy to include specific controller, service, filter and direcitve that inherent from controllers/controllers, services/services, filters/filters and directives/directives in application. Put all together and bootstrap AngularJs application when DOM ready. Everything looks so good but RequireJs config.js. I have to tell RequireJs the external libraries path and module name i include to the application. There are more information about RequireJs configuration in here. Final step. All you need to do is go Views/Shared/_Layout.cshtml and add @Html.ViewSpecificRequireJS() before body close tag. @Html.ViewSpecificRequireJS() is a ASP.NET MVC static method and it will read your project file structure. 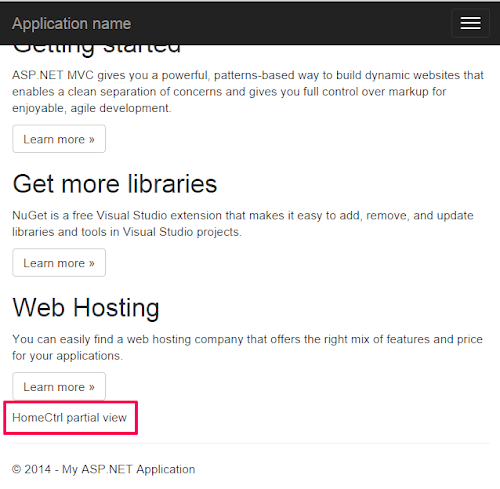 If you define an application in /public/js/view/Home and ASP.NET MVC route is mapping to views/controllerName. @Html.ViewSpecificRequireJS() static method will redener it, otherwise not. Don’t forget to include @Html.ViewSpecificRequireJS() Namespace @using Requirejs.Helpers in top of Views/Shared/_Layout.cshtml page. you have to add <div ng-view></div> to thoes ASP.NET MVC views page for AngularJs route. [Cydia] How to export Audio Record m4a directly.